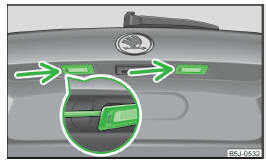 Insert the tool into the opening above the fog light » Fig. 159 - A (Fabia Scout) » page 158, Vehicle tool kit and remove the cover. Insert a finger into the opening next to the foglight » Fig. 159 - B (Fabia RS) and remove the cap. AUnscrew » page 158, Vehicle tool kitthe screws » Fig. 160 - with the screwdriver . Press the locking tab 1 » Fig. 160 on the connector A and remove the connector from the bulb holder B . Turn the bulb holder B and bulb in the direction of the arrow to the stop and remove. Replace the bulb, insert the bulb holder and new bulb and turn in the opposite direction to that of the arrow to the stop. Insert the plug A into the socket B .
Retighten the screws and insert the cap. The cap must engage firmly. Insert a flat screwdriver into the opening in the area of the arrow » Fig. 161 and carefully press towards the centre of the lamp; the lamp pops out slightly as you do this. Remove the faulty bulb from the holder and insert a new one. Replace the glass cover and push in until the stop. Make sure that you install the glass cover in the correct position.